The bludgeoning darkness swept across the land leaving an ooze of mediocrity in its wake. The lands, once verdant in bright colors touched by galloping dreams, were now rent asunder. The hopes and visions of the youth of tomorrow lay wasting in a world filled with fifty shades of bland. A dull ache of complacency had replaced the giddy optimism which once held firm. The lords and ladies who once led the realms now were gone to other worlds or had sold their souls for the price of a box of popcorn. Into this miasma of despair rode a knight in glistening armor. His name, Carlos Raphael of the Champion Comics kingdom, struck no fear, emblazoned no souls, and yet, somehow, this brave knight, and his ideas for a better future, found followers. He envisioned a world where comics could matter again. A world where the people who read them could find their avatars ensconced within the pages. A world where the dreams of the few could become the dreams of the many. He was joined by a small group at first; Sir Rodney Lockett of Iron Gate Comics, Sir Jermaine Christmas of Kringlistic Comix, Sir Joe Davis, Sir Chris Thomasma, Sir Tony Klapper of Nevaland/Crazy Monkey Ink Comics, Sir Roy Johnson of Standard Comics, and Sir John Jones of Heroestcg came together and formed the alliance that would come to be the home of The Power Company. They knew that, individually, they could not beat back the darkness or erase the stains left by the evil accountants and toadying sycophants who now ruled the comic kingdom. They were too entrenched, the masses too beaten and wary, to unseat easily. 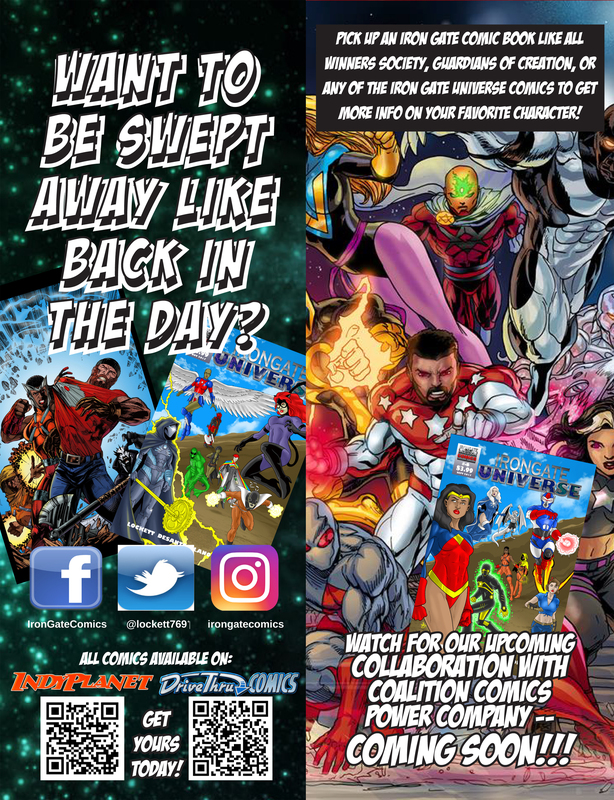 Click ad above or View Image Full-Size and scan the QR codes on this ad to buy now from IndyPlanet or DriveThru Comics!! The populace had become accustomed to being force fed the most mollifying shades of Pantone™ there were. From gray to beige, and a few points in between, the people knew not anything else and accepted it as though it were normal. It was up to The Power Company to remedy this. To return joy and color to the universe. Initially they began with small raids. Indy books set on the edges of the comic-verse, designed to draw the curious out. To ensnare those who still held, however minutely, a shred of hope. Small raids or no, those early raids took their toll on our valiant knights. Sir Chris Thomasma and Sir Joe Davis fell from the union. The former, bowed but unbeaten, rallied his troops to continue the fight on his own. The latter left his trusted characters, Victory and Sebek, to continue with the Power Company whilst he did open up battle on a new front. While Sir Davis was still represented in the group by his creations it was felt they needed one more knight to join them to fill out the order. After searching far and wide they ran across a heroic soul who was also fighting off the hum drum of conformity. Using a combination of Vudu and guile she was gaining ground others could not. It was soon agreed by all that Lady Dorphise Jean of Gente Entertainment, LLC should join them in their battle. The final, and formal, iteration of the creators needed for Power Company complete, they set forth to bring comics back to their forgotten glory. I’ll admit this all seems a tad overwrought. But, as you read on, I hope you’ll agree their end game is epic. And worth supporting. Let’s meet the full team. While Sir Joe Davis may no longer be an active member his characters Victory and Sebek are widely respected and will be integral parts of the Power Company universe in the times to come. Sir Rodney Lockett of Iron Gate Comics has released five titles under the Iron Gate Universe banner and has two new additions, The All-Winners Society and Guardians of Creation, ramping up to join the fray. Sir Jermaine Christmas of Kringlistic Comix brings with him a bevy of beauties, Mistletoe, Pigeon, Tempest, Lucky Charm, and Ms. America, to join the battle alongside other heroes who have been waiting for the chance to shine. Sir Tony Klapper of Nevaland/Crazy Monkey Ink Comics is rallying his crew around his new hero, Midnite’s Avenger. Darum, Etoiles Finder, Cherry Bullet, and the legendary Death Squad Zero are joined together in their quest to make the Power Company a force of, heretofore, unimaginable influence. Sir Roy Johnson of Standard Comics found a way to resurrect the careers of, long forgotten, heroes like TNT Todd or the Grim Reaper and mix their talents in with his original characters like UltraMan, Optima, Star-Storm, Chthonak, Emulex, and Dreadhelm. His characters help bridge the gap between the halcyon days of yore and the shining beacon of the future. Sir John Jones is the owner and creator of heroestcg.com, an idea that started early this century for a trading card game composed of hundreds of heroes and villains. John started out as a 2D artist but then he found he had an affinity for 3D. And utilizing tools such as Poser, DAZ3D, Sculptris, Autodesk 123D Design, ArtRage, PD Particle and Photoshop he was able to transform the 3D into composite art to bring it all together. Though he took, a much chagrined, ten year hiatus from doing art, he is back doing what he loves and embracing his passion to create superhero themed art. Lady Dorphise Jean of Gente Entertainment, LLC brings a new type of hero to the crew. Destiny, a young Haitian girl, is attempting to deal with puberty while coming to grips with magical powers. Dorphise brings a deep knowledge of Haitian culture, history, and language, to the group to help further their goal of bringing unique kingdoms together for a common goal. Lastly they have Sir Carlos Raphael, of Champion Comics. He brought this group together under the auspices of the ICC (Independent Creators Connection). There, away from prying eyes, they honed their crafts, worked on ways to work together, and set about on their quest to rid the world of the mundane. Carlos has authored the popular series American Revere, Night Demon, Trap Door, Viking, and many more. Champion is an esteemed company which has followers the world over. He was the perfect person to lead these brave souls on their journey. A dull ache of complacency replaced the giddy optimism which once held firm. The lords and ladies who once led the Realms now were gone to other worlds or had sold their souls for the price of a box of popcorn. They originally gathered as a group on Messenger to hash out the details of what would be their publishing agreement. They agreed early on they’d work towards the goal of launching a Kickstarter campaign. Along with that came the pact that agreement that they’d share in the financial cost of prepping, promoting, and producing art for Kickstarter. The gathering of the above finally came together under the banner of Coalition Comics. They then spent the next eight to ten months honing the new storyline, hiring commissions, setting creative teams, and preparing for the moment of the launch. They raised $4,500, which was more than their initial goal of $4,000 and were ecstatic to have something turn out this successful after all the preparation and planning. They currently have over two thousand followers on social media. They’ll be making merchandise and comics available in December of 2017, as soon as they deliver the rewards to their Kickstarter backers. They want them to enjoy the Power Company first, before anyone else gets the opportunity. After all, it is only fair that those who took the early risks reap the first rewards. The Power Company art is being handled by Luis Rivera (pencils and inks), Escomic! (colors), Warren Montgomery (lettering), along with a plot and script by Coalition Comics. The cover art is being provided by, comic art legends, Jason Metcalf, Joe Correa, Joel Cotejar, and Luis Rivera, so you know it’s all beyond reproach. The story is an amazing collaboration between all involved, and they are currently gearing up for Kickstarter #2, which will close the first arc. Then they’ll begin the four issue arc that will see a shift in the team, the guest appearances of several independent comics creators and their characters, a close of the first storylines, and the workup to the trade paperback and hardcover edition of issues 1-6. To make this all work it was agreed the characters would be considered “on-loan” from the respective partners in Coalition Comics. Each creator reserved the right to pull their character from the book and the company wherever they pleased. There are no out clauses, intent to leave clauses, or binding penalties. A partner is free to leave whenever they want, but a return would need approval of five of the six remaining partners, and if that partner is replaced by a majority vote with another, there is no potential to return unless another partner were to leave. The coalition is currently capped at seven members at the moment, making it the most exclusive, and cool, club in the comic book world. The Power Company universe currently consists of seven main heroes brought together by Professor Bizarre, a collector of the rarest and most powerful museum pieces in the universe, and a powerful, mystic. Due to a baffling time/space portal, seemingly created out of nowhere, the world conquering Cyborilla, with his claims of superiority over homo sapiens, assembles a group of like- minded “soldiers,” Necromage, Abominus, Sebek the Medjai, Priestess Danielle, BrimCoal, Poison Arrow, and Overcast, bound together under the moniker Damage, Inc., to help him take over Professor Bizarre’s Earth and overrun his sanctum. Traveling the outermost independent comics’ universe, Professor Bizarre recruits Five Star, Metalmorph, Forecast, Crimson Streak, Victory, Spirit’s Destiny, and Killer Wail to fight the good fight, and rid his world of this threat. In issue#1, Damage Inc. invaded Earth JJ2 intent on taking over, not only, the entire planet, but also professor Bizarre’s lair which houses those rare artifacts. Employing a divide and conquer tactic, Damage Inc. attacked Washington D.C., and more directly the White House, which was being protected by the Guardians of the White House, Steel Wolf (Eric Bennett), Thunder Woman (Daniel Hoins), and Midnight Owl (Cuong Nguyen). Necromage unleashed a horde of zombies and demons to keep Power Company occupied, while Cyborilla and Necromage planned a sneak attack on the lair with the help of the vengeful spirit Eden, and her demonic minion Asbeel. She is the raw energy released from, the now dead and abandoned, Garden of Eden, and her hatred of humanity knows no bounds. Along the way, there are twists and turns, ebbs and flows, and a member of Power Company is affected forever by the end of issue #1. Join them in making this project come to life, and spread the news, share the fun, and let’s raise the bar for what independent comics can be and fulfill their potential! That’s the Power Company. What you think you know writ large in bright colors accented with breathtaking adenture. Make sure you don’t miss it.